Chrysler LLC announced late Wednesday that it is stopping all vehicle production in the United States for at least a month. Chrysler ordinarily shuts down operations between Dec. 24 and Jan. 5 for the holidays. This closure would add roughly two weeks to that shut-down. Chrysler would not say how many fewer vehicles would be produced because this shut-down. A total of 46,000 employees will be effected by the shut down. Those employees will be paid during the shutdown through a combination of state unemployment benefits and Chrysler contributions, but they will not receive the full amount of their working pay, a Chrysler spokesman said. 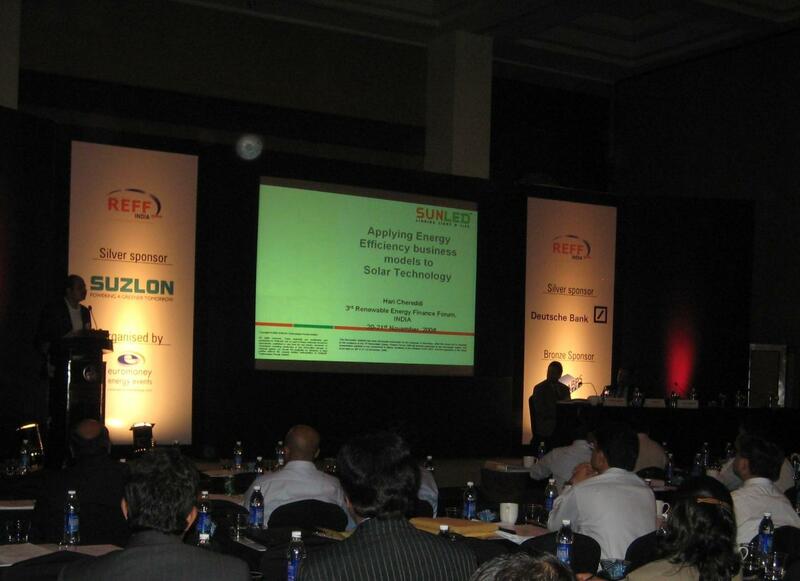 Mr. Hari Chereddi, Managing Director, SUNLED Technologies was invited to present at the prestigious 3rd Renewable Energy Finance Forum organized by Euromoney – Held at Mumbai on 20th & 21st November 2008. He was speaking on ‘Applying Energy Efficiency business models to Solar Technology. India’s accelerated economic growth has in turn generated an ever increasing demand for energy, and opportunities in the domestic market for renewable energy generation are plentiful. The 3rd REFF-India was a unique forum for discussions between technologists, decision makers, investors and financiers. The diverse speaker faculty featured high-level government officials, leading technology manufacturers and project developers, and key financial institutions operating in the Indian renewable energy sector. What if General Motor Fails? Catastrophic Chain Reaction that will eliminate around 3 million jobs. – Part Makers will Shut down and will be out of business. – Rental car companies, purchasers of about 15% of GM’s volume, would get nervous, too. They often sell their used models back to the auto maker. They’re worried they would have to liquidate the cars themselves if GM went bankrupt, says Maryann N. Keller, a longtime GM watcher who sits on the board of Dollar Thrifty Automotive Group Inc.
– GM’s creditors would also stand to suffer. The company has $31 billion in long-term debt, most of it due in 2023 and beyond. GM and Ford reported they spent a combined $14.6 billion more than they took in last quarter. GM said it could run out of money by the end of the year. Ford said it could last through 2009, but only because it arranged a hefty credit line last year.Next week, Congress plans to consider giving the auto industry part of the $700 billion Wall Street bailout during a lame-duck session. On the other hand “Bankruptcy could do great things for GM,” says William J. Rochelle III, a bankruptcy attorney with Fulbright & Jaworski LLP. But, of course, Chapter 11 is no sure bet. History is full of examples of companies that have emerged from bankruptcy simply to return in a few years. As airlines and steelmakers have done, GM could use Chapter 11 to rewrite union contracts, potentially enabling it to slash retiree benefits and close plants without having to pay furloughed workers. The auto maker could even dump tarnished brands and get bankruptcy court protection from dealer lawsuits. And the finger pointing begins. The Alaska governor and vice-presidential candidate, according to Mccain’s aide , did not know that Africa was a continent, could not name all three countries in the North American Free Trade Agreement (that would be the US, Canada and Mexico) and declined to prep for her now infamous Katie Couric interview. She also argued that South Africa was simply a region of the larger country of Africa. Furthermore, the McCain aides told that Mrs Palin threw tantrums over bad press reviews and was a shopaholic. He also reported that chief McCain foreign policy advisor Randy Sheunemann was fired late in the campaign for allegedly leaking details of the splits. One senior aide told the magazine that she was told to buy three suits for the Republican National Convention and hire a stylist, but instead, the vice-presidential nominee began buying costly goods from stores like Saks Fifth Avenue and Neiman Marcus. At one point during the campaign, Palin’s youngest daughter, seven-year-old Piper, was photographed carrying a US$800Louis Vuitton bag. Two sources told Newsweek the goods were bought by a wealthy donor, who was flabbergasted when he saw the bills. Palin also allegedly instructed low-level staffers to buy her new clothes with their credit cards, something the McCain campaign only discovered last week when the aides tried to get reimbursed. Even if these reports are accurate, why was she okayed as running mate? CNN’s Jessica Yellin goes holographic to chat with Wolf Blitzer from Chicago.